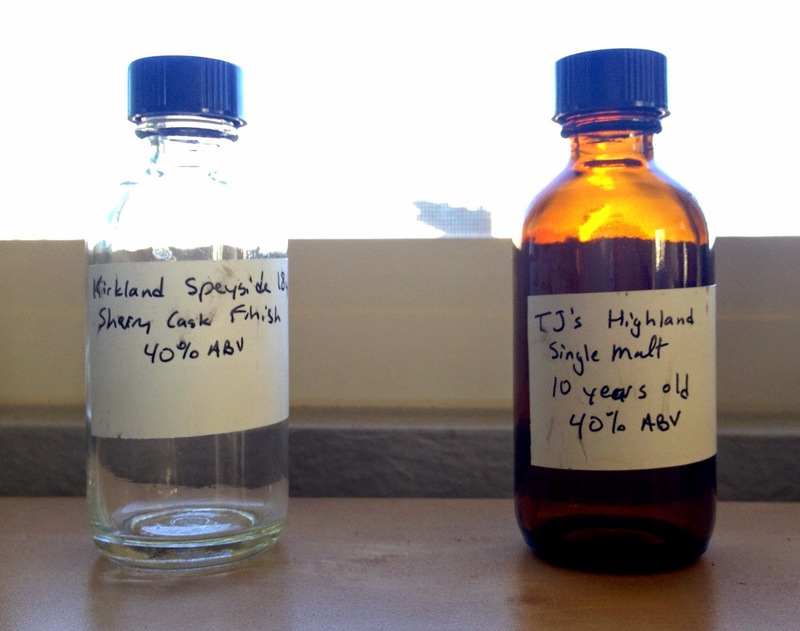 During this Thanksgiving week, I'm determining my level of thankfulness for two inexpensive store brand single malts: Trader Joe's 10 year old Highland (reviewed on Monday) and Kirkland 18 year old Speyside Sherry Finish (reviewed here today). While not terrible, the Trader Joe's single malt was mild-to-bland on the palate, almost a light beer type of whisky. Kirkland's single malts are provided by Alexander Murray & Co., just like TJs'. So they also have 40%ABVs and are inexpensive. Like yesterday's TJs sample, this one was provided by Florin (a prince). When he and I first tried this whisky two years ago, we found some similarities between it and Tomatin 18. But Tomatin is not in Speyside, so if anyone has anything theories as to what distillery provided this "Speyside", please let me know in the comments below. This whisky has been replaced at my local Costco by a 20yo sherry finish Speyside and a 18yo sherry finish Highland at different times, but there may still be bottles of this one left on shelves at other locations. The color is an orange gold. The nose's most prominent straightforward notes are honey, nutty sherry, fuji apples, and maple. But it also shows quirkier things like vinyl, graphite, new shoes, and wet sheep. The palate is mellower than the nose, malty and tangy. Milk chocolate, caramel, honey, and peaches make up much of the delivery. A chemical bitterness intrudes here and there. Burnt black raisins and wood pulp also have cameos. The finish grows more citrusy and the bitterness improves a bit. The wood pulp lingers as do those burnt black raisins. This was an improvement over the Trader Joe's 10yo right from the start. And it's better than one would normally expect from a 40%abv store brand whisky. But I wouldn't say this is a particularly great single malt. Again, the nose is the best part, showing some decent complexity possibly coming from the age. The palate works occasionally, but something keeps screwing it up -- whether it's e150a or some crap casks. We consumers should not be lured by an 18 year age statement, as in "Woo! 18 year old whisky for only $30! I'll buy a case!". An older whisky doesn't guarantee quality and a bargain isn't necessarily a great find. (This is coming from someone who has been hunting bargains for his entire life. This year alone I've purchased a half dozen cheap whiskies which have provided me nothing but regret. More about this issue another time.) I think $30 is a reasonable price for this single malt. The quality is significantly better than the Trader Joes 10yo, arguably better than Glenmorangie Lasanta, but falls short of Tomatin 18yo. Speculation points to Glenrothes, Glen Grant, or even Speyburn (note that all three are neighboring distilleries) as the source. Alexander Murray also bottles Lismore Single Malt which is also speculated to be Glenrothes. Jeebus, they're the ones responsible for Lismore?! That is some awful awful whisky. I even had a chance to try the 21yo Lismore this year and it was oddly similar to the NAS version. This now makes me REALLY question Alexander Murray & Co's barrel selection / blending acuity. Admittedly, I'm not a fan of Glenrothes -- I'd take this Kirkland thing over the Select Reserve any day of the week and twice on Shabbat. I appear to be wrong about Lismore's ownership. Since I'd only seen Lismore at Trader Joe's, I made the assumption that they were bottled by Alexander Murray which handles the T.J. and Kirkland bottles. However a little Google-fu reveals Lismore is owned by William Lundie & Co. Ltd. William Lundie is just as mysterious as Alexander Murray with the Whisky Portal (http://www.whiskyportal.com/distillery.asp?DistilleryID=1309&DistilleryName=William+Lundie+%26+Co.+Ltd.) suggesting that they are owned by... drumroll... J&G Grant.... meaning Lismore may be Glenfarclas. If Lismore is Glenfarclas, then I think I know where all the bad barrels are going. For a while a lot of Glenfarclas was the sherried element going into Isle of Skye 8yo. I've heard that Skye switched to sherried Glenrothes a couple years ago. I can't say for certain which garbage barrels are going into Lismore, but I remember reading in one of the geek forums that it was 'Rothes. In any case, Lismore is a good example of what crap single malt barrels are like when they're not diluted by grain whisky in cheap blends.